Ancient Rome game is one of more than 400 free Games you can download at Free Ride Games, The greatest empire the world has ever known is in the palm of your hand! Expand the Roman Empire from a simple hamlet into the glorious expanse of power and dominion for which it is known today in Ancient Rome, a casual city building simulation game for the history buff in everyone. Throughout 30 briskly paced levels of this Strategy game, you'll produce goods, construct buildings, attract workers and more. Meet your goals and earn the approval of the emperor as you carve your name into the annals of time! 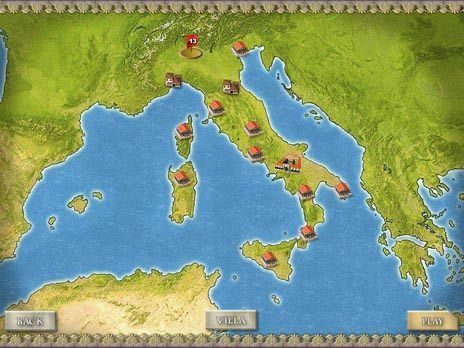 Download Ancient Rome for FREE and enjoy: * 30 levels. * Dozens of upgrades. * Colorful graphics. * Immersive atmosphere. * Simple controls. Free Ride Games is the only place where you can download over 300 top games for free, including Hidden Object games, Time Management games, Match Three games, Sports games, Puzzle games, Arcade games, Card games, Board games, Flash games, Fashion games, Food games, Online games, Word games and many more. We have hundreds of choices from the leading game publishers like iWin, PlayFirst, Sandlot Games, Mumbo Jumbo etc. Download Ancient Rome free game and play it now.